Lyle, a former Great Britain international, left the club on 23 October with forward Aaron Nell placed in charge. 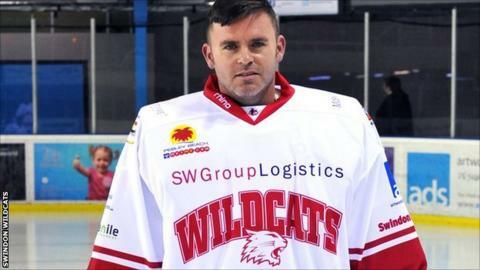 "Stevie will be returning as a player and we're delighted to have him back," said Wildcats manager Steve Nell. "Stevie is a great goalie and is a massive part of our club." Lyle initially signed for the club at the start of the 2013-14 campaign and became head coach in 2015. He said the strains of the role proved too much but was excited to return to the ice as a player. "I was taking on too much pressure and it wasn't healthy for myself," Lyle told BBC Wiltshire. "I felt I needed a break from the situation. "I think everyone is excited I am coming back. It's time to forget about it and move on. Right now I'm looking forward to getting on the ice and helping the Wildcats."